Fright Nights is now on at Playland nightly at 7:00 pm until October 31st (save for October 22nd and 23rd). If you like things ghlouish, scary and to get your heart racing, this is your spot. Advance tickets recommended, some evenings to sell out. It’s voting day this Saturday at many locations throughout the City from 8:00 am to 8:00 pm. There are, in case you missed it, 158 candidates for 27 positions for Mayor, School Board, Council Members and Parks Board. Even if you don’t know who to vote for in all positions, vote for the ones you want. If you are unsure where to vote, the City has a Where To Vote. You only need to put in your postal code and it will give you the polling stations in that area. Remember to bring ID when you go to vote. Monster Theatre presents The Shakespeare Show filled with tragic heroes, a few witches Anne Hathaway and Queen Elizabeth at Havana Theatre Friday & Saturday night. Tickets are $15-20 and available online through Showpass. This Saturday you are invited to the East Van Opry. Now in its sixth year, the event happens at the Rio Theatre this Saturday night. Expect an eclectic mix of this City’s stage performers. Advance tickets are $24, or at the door for $28. Visit The Rio Theatre for tickets. 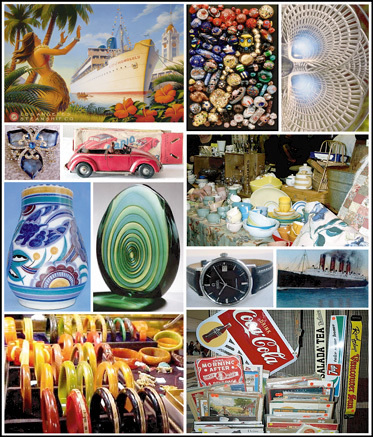 If you love collectibles, vintage, funky kitschy items, maybe a little art deco, the Retro Design & Antiques Fair is the place to be this Sunday. There will be a 175 tables at the Croatian Cultural Centre to browse. Event happens 10:00 to 3:00 pm. Admission is $5 at the door, children under 13 are free. Looking for something new to check out? Reminder Caffe La Tana just opened next to Pepino’s Spaghetti House. Cafe is open 7:00 am – 7:00 pm. If it’s live music you are after, the Libra Room on The Drive has a regular line up of music. Tangent Café hosts live jazz Sunday nights from 6:00 to 8:30 pm. Saturday, Pat’s Pub has live jazz Saturday afternoons from 3-7 pm, no cover. Two Farmer Markets happening this weekend – Saturday it’s Riley Park (10 am – 2 pm) and Trout Lake (9 am – 2 pm). To see more of what’s on in East Vancouver, check our Event Listing. 21st Century Promotions is holding a Retro Design & Antiques Fair on Sunday, October 16th at the Croatian Cultural Centre, 3250 Commercial Drive. There will be 175 vendors on hand with a variety of items including antiques, collectibles, memorabilia, jewellery, pottery, postcards, records, retro furnishings, dolls, toys and so much more. Should you be in need of having an item appraised, they will be holding ‘drop-in appraisals’ from 10:00 am – 3:00 pm on a first come first served basis. They do ask that the items be small enough to carry, with a maximum of three items per person. The cost for a verbal appraisal is $10 per item or $25 for 3 items, cash only. The drop-in appraisals will be conduct by Gale Pirie, an independent accredited member of the Canadian Personal Property Appraisers Group. The fair runs from 10:00 am – 3:00 pm. General admission is $5 at the door. There will also be a special early-bird admission for $20 from 7:00 am – 10:00 am for those wanting a jump on things. Children under 13 are free with adult admission. If you are not able to attend February’s Retro Design & Antiques Fair another one will be happening on December 4th . Should you wish to have a coffee and/or lunch before or after your shop, consider Commercial Street Café for something close by. It’s a great little hidden gem tucked away only a block down the street from the Croatian Cultural Centre. Open Sunday from 9:00 am – 6:00 pm and located at 3599 Commercial Street at East 20th Avenue. Of course, going North up the Drive after the market, you have a whole host of great coffee shops, bakeries and restaurants to choose from. Of course, if you are on the hunt for vintage items, you may wish to make a stop at great new little shop a very short walk from the Croatian Cultural Centre called Second Nature Home. This store has an array of great eco-friendly and organic products for the home as well as their own selection of vintage items. Second Nature Home is located at 1827 Victoria Diversion and is open 2:00 pm – 6:00 pm on Sundays. 21st Century Promotions is holding a Retro Design & Antiques Fair on Sunday, February 22nd at the Croatian Cultural Centre, 3250 Commercial Drive. There will be 175 vendors on hand with a variety of items including antiques, collectibles, memorabilia, jewellery, pottery, postcards, records, retro furnishings, dolls, toys and so much more. Should you be in need of having an item appraised, they will be holding ‘drop-in appraisals’ from 10:00 am – 3:00 pm on a first come first served basis. They do ask that the items be small enough to carry, with a maximum of three items per person. The cost for a verbal appraisal is $10 per item or $25 for 3 items, cash only. The drop-in appraisals will be conduct by Gale Pirie, an independent accredited member of the Canadian Personal Property Appraisers Group. The fair runs from 10:00 am – 3:00 pm. General admission is $5 at the door. There will also be a special early-bird admission for $20 from 7:00 am – 10:00 am for those wanting a jump on things. Children under 13 are free with adult admission. If you are not able to attend February’s Retro Design & Antiques Fair another one will be happening on June 28th. Should you wish to have a coffee and/or lunch before or after your shop, consider Commercial Street Café for something close by. It’s a great little hidden gem tucked away a few blocks down the street from the Croatian Cultural Centre. Open Sunday from 9:00 am – 6:00 pm and located at 3599 Commercial Street at East 20th Avenue. Of course, going North up the Drive after the market, you have a whole host of great coffee shops, bakeries and restaurants to choose from. Of course, if you are on the hunt for vintage items, you may wish to make a stop at great new little shop a very short walk from the Croatian Cultural Centre called Second Nature Home. This store has an array of great eco-friendly and organic products for the home as well as a good selection of vintage items. Second Nature Home is located at 1827 Victoria Diversion and is open 2:00 pm – 6:00 pm on Sundays.